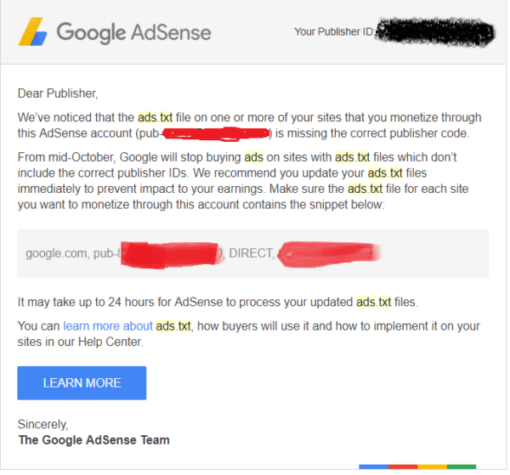 Dear Publisher, We’ve noticed that the ads.txt file on one or more of your sites that you monetize through this AdSense account (pub-123456789012345) is missing the correct publisher code. From mid-October, Google will stop buying ads on sites with ads.txt files which don’t include the correct publisher IDs. We recommend you update your ads.txt files immediately to prevent impact to your earnings. Hi I came across your website after doing a search on how to add the ads.txt file for Google adsense. 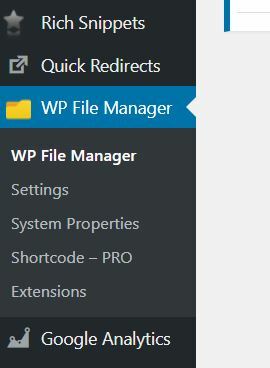 I d/l the file manager into WordPress and already have my ads.txt file but how would I add that little snippet that Google put in their warning? So what’s the easiest way to upload an ads.txt file onto your WordPress root domain? Once you’ve created your ads.txt file (by opening notepad, adding in the snippet code from the email, and saving it as ‘ads.txt’), go to your WordPress dashboard and click “add new” plugin. From there, search for “File Manager”. There are several “File Manager” plugins, you’ll want this one created by mndpsingh287. Okay, now install and activate it. This plugin allows you to access, edit, add and remove files from your website without having to FTP into your site. Once you’ve activated it, “WP File Manager” should have been added to you left hand navigation. Click on “WP File Manager” and the main screen should show all the files in your root domain such as wp-admin, wp-includes, .htaccess file, favicon.ico and more. That’s it. Your ads.txt file is now in the root domain of your WordPress-powered website. Congrats. Now do this for any other sites you may have. If you want to double-check to see if the file is there, type in yourwebsite.com/ads.txt and if it’s there, it will spit out the snippet code you added in your notepad earlier. Now you just have to wait for Google to see the ads.txt file. It may take up to 24 hours for AdSense to process your updated ads.txt files. You’re good to go until Google decides to add another mandatory technical requirement. You can learn more about ads.txt, why they need it and how they suggest to add it to your website at Google AdSense’s Help Center section on ads.txt. Thank you so much for this tutorial! Every other tutorial I read made no sense to me, and this one was straightforward. After two days of not having ads, I hope I will have fixed this issue. It was easy to do with your help and I am forever grateful. wow great tutorial. I’ve been struggling for three days to display my ads on my site, and finally end up your remarkable tutorial. Thanks in advance. Thank you so much sharing this! thanks a lot sir, i have been trying to add ads.txt to my website but all the plugins showed blank page. Love your site. Just Carried this process out now. Waiting to see if it works for me too. Thanks a lot for sharing this tip.